A dagger or khanjar with a two edged re-curved blade. The blade is thickened at its point and chiselled with two deep grooves on each side. 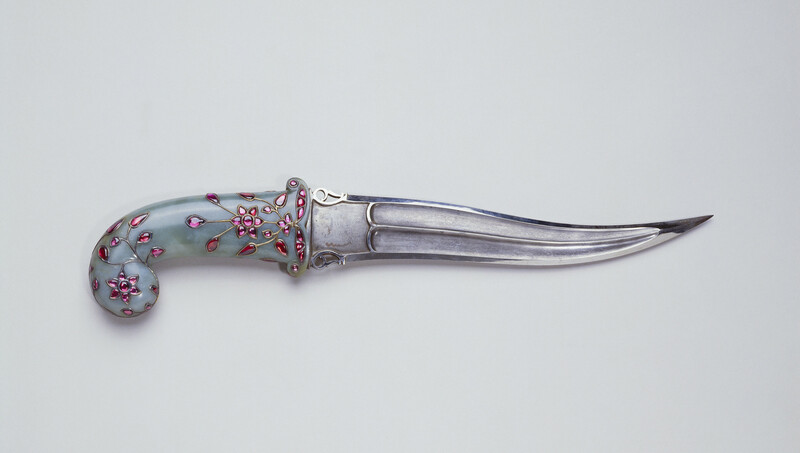 The hilt carved out of jade is inlaid with garnets arranged in a floral design. The form and style of decoration of the hilt suggests it was made in the Mughal empire, which by the late eighteenth century stretched from modern-day Afghanistan to Bangladesh. The use of jade within India increased during the reign of Alamgir (r.1658-1707) after trade routes into modern-day Hotan in China became accessible to the Mughal court. Jade has been traded in Hotan since 5000 B.C. This dagger may have reached Nepal from India as a diplomatic gift.